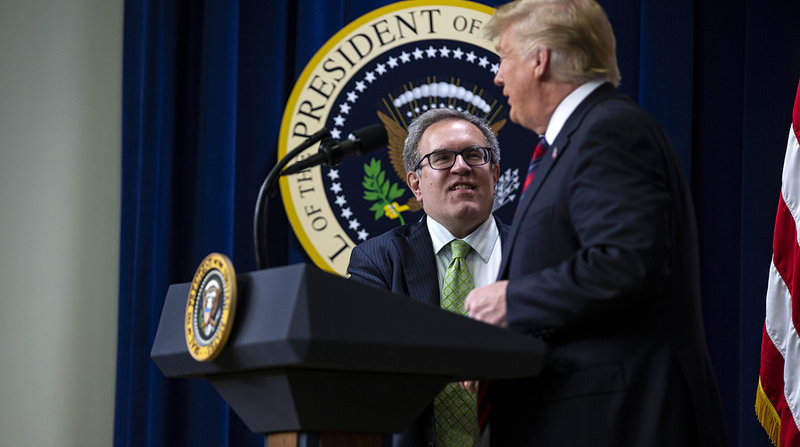 President Donald Trump announced his intent to nominate Andrew Wheeler for the administrator role at the U.S. Environmental Protection Agency, where he currently serves as acting administrator. “He’s done a fantastic job, and I want to congratulate him,” Trump said about Wheeler at a White House ceremony Nov. 16 for Medal of Freedom recipients. The top Republicans on the Environment and Public Works panel also have praised Wheeler’s focus on the administration’s pledge to streamline regulations. Yet, despite the president’s praise and backing from senior Republican senators, when Wheeler is nominated he likely will find himself in a high-profile confirmation battle when the Republican-led Senate committee overseeing environmental policy schedules its hearing with the nominee. Sen. Tom Carper (D-Del. ), the Environmental and Public Works panel’s top Democrat, expressed concerns about Wheeler’s record since he stepped in for administrator Scott Pruitt in July. Pruitt resigned after a barrage of ethical concerns. “I have a friend who, when asked how [Wheeler is] doing, always says, ‘Compared to what?’ Compared to administrator Pruitt, Mr. Wheeler is better. Compared to administrators [William] Ruckelshaus or [Christine Todd] Whitman, he’s not doing nearly as well,” Carper said. “If the president intends to nominate Andrew Wheeler to be the administrator of EPA, then Mr. Wheeler must come before our committee so that members can look at his record as acting administrator objectively to see if any improvements have been made at the agency since he took the helm,” the senator added. Ruckelshaus was EPA chief during the Nixon administration. Whitman ran the agency under President George W. Bush. Other Democrats on the EPW panel continue to question Wheeler’s lobbying career prior to EPA. Before his Senate confirmation last year to EPA’s deputy post, which he won 53-45, Wheeler had lobbied on behalf of coal firm Murray Energy Corp.
“After spending a career promoting the policies that make our air and water dirty, Andrew Wheeler will never understand that saving coal is not the job of the EPA,” said Sen. Ed Markey (D-Mass.). Groups such as the Sierra Club, the League of Conservation Voters and the Natural Resources Defense Council also expressed opposition to Wheeler’s nomination. “As acting administrator, Andrew Wheeler has pushed policies that would damage our health and environment. He doesn’t deserve a promotion,” said Ana Unruh Cohen, managing director for government affairs at NRDC. The president’s stance on climate change, and his administration’s push to undo Obama-era air and water quality safeguards has garnered critics. During his tenure as acting chief, Wheeler’s tasks have included an emphasis on emissions standards for trucks and cars. Earlier this month, EPA officials announced an environmental review to reduce nitrogen oxide emissions from heavy-duty truck engines. The review effort, labeled the “Cleaner Trucks Initiative,” will aim to update the NOx standard. Another initiative for Trump’s EPA is an Obama-era regulation that limits the production of glider trucks. Last November, Pruitt proposed to repeal the provision that caps at 300 the number of gliders a manufacturer can build per year. Wheeler then had briefly allowed unlimited production of gliders through 2019, before withdrawing his action amid pushback from environmental groups. Several attorneys general had filed lawsuits attempting to keep the cap effective. Glider trucks combine new truck bodies with older engines.